A bit more of a restaurant than a pub. We were a group of 23 and that filled them up, if you want to eat on a Sunday book! It's a Harveys pub, so Sussex and IPA were on pump with a draught cider as well. Food was very good and you can order smaller portions of some dishes (e.g. roasts, burgers without chips) which suited some people well. Service took ages though, we waited almost a hour for our grub. Visited on Saturday lunch and was pleasantly surprised by menu; varied and not too dear considering the size of the portions. Good Harveys beers well kept. Visited this pub on a Sunday night when it had live music and was very busy. It was offereing three Harveys beers including Copperwheat, however this went off during our order. The 2 pints of Copperwheat that we had been given were not very good (the last ones out of the cask so rather dead) and we asked for them to be changed for something else. The landlady was initially reluctant to change them but checked one of the pints and agreed that they were not right and was then very happy to change the beers. 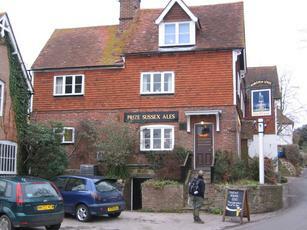 We did not see any of the food but the pub's atmosphere was good and I suspect that it is a lively village pub. Worth a return visit. Proper village pub - blazing log fire on a cold winter morning, nibbles on the bar at Sunday lunchtime, interesting menu and a decent pint of beer (with a choice of three Harveys ales) - what more could you want?